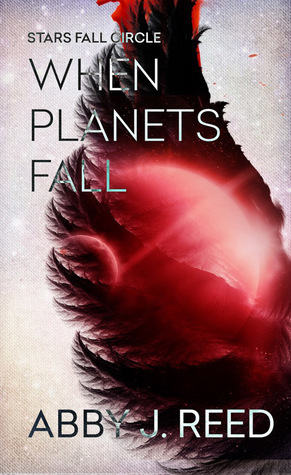 Sci-fi novels are tricky, especially when they take place on another planet. The author doesn’t just have to work out a plot and realistic characters. They have to create an entire universe within those pages, a whole world with rules on how it all works. And if the rules don’t make sense, the story will begin to unravel and a reader won’t be willing to believe. Thankfully, Abby Reed has pulled it off. I was more than willing to follow her into this story, right from page one, and I am going to be going crazy over here, waiting for the sequel. I don’t want to jump through hoops trying to explain a world in a few short sentences that took a whole book to lay out. But at the same time, I will explain that the very nature of the book might be better suited for a more mature teen reader. It is listed as YA, but there is a certain level (not too graphic) of violence, considering it’s building towards a war. Death is a living, breathing part of their lives. I love that Reed wasn’t shy about putting her characters through the wringer. They get banged up, thrown around, shot at; you name it! The main protagonist, Breaker, has a prosthetic leg, after losing a leg in one of those violent acts I mentioned earlier. While it causes some complications, it’s never seen as a weakness. Rather than lamenting the loss of his leg, Breaker has a unique bond with his prosthesis, even giving it a name. The other main MC is Malani. I don’t want to go into too much depth about what sets her apart from all the other red-bloods, but having been raised by blue-bloods, she feels set apart from the other red-bloods. She wants nothing more than to go home, but she knows too much about the blue-bloods’ technology, she’s too valuable. She suffers regularly with anxiety and PTSD, after being held prisoner by the green-bloods. There aren’t many chapters from Luka’s perspective, but I suspect that he will play a much larger role in the sequel. I can’t get a good read on him yet. I spent much of the book considering him a villain, and yet there are redeeming qualities about him that I feel could develop into something more. Predictions for the sequel? I can’t even go there. When the book wrapped up, I was left on uneven ground. I was a little disappointed that the characters didn’t necessarily end up on the best footing with each other. Trust will need to be built up again, and I can’t even begin to guess where they’re headed. They will need to rely on each other, no doubt, but I feel like there are still too many loose threads left danging. I sincerely hope that we return to a lot of the issues still hanging. Thanks for hosting today! Sci-fi is definitely not easy – and can be a hit of miss for me for that reason. This sounds like it was very well crafted and fun overall, though!